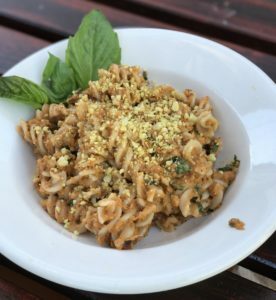 Grilled vegetable pasta sauce from Eat Like a Yogi — Not just for pasta! This grilled veggie pasta sauce is waiting to become your new summer staple. It highlights the very best of summer produce—zucchini, tomatoes, and basil—and will freeze well into the colder months when you want something light or are craving the taste of summer. Because the flavors of zucchini and eggplant are subtle, this sauce can be adapted a number of different ways. Try adding lots of fresh herbs like oregano and thyme, or spice things up with some chili powder or garlic. A bit of tahini lends earthy complexity while a tablespoon of nutritional yeast deepens the flavor while boosting B vitamins. This pasta sauce isn’t just for pasta! It pairs ideally with other Mediterranean staples. For example, you can fold it into cooked rice and stuff it into grilled peppers or grape leaves. Serve it alongside a bowl of hummus on a mezze platter with cucumbers and pita for dipping, or spread it on a gyro filled with lettuce and falafel. There is no way you won’t enjoy this beautiful, simple pasta sauce, whether it ends up on noodles or not. Toss the veggies in 1 T of olive oil plus a pinch of the salt and grill them over high heat for 10-12 minutes. When the vegetables are soft and nicely charred, pour them into a blender with the remaining olive oil, salt, oregano, lemon juice, and basil. Blend until the vegetables are thoroughly mixed. One recipe makes around 7-8 cups, which is enough sauce for one lasagna or two pasta dishes (using a pound of pasta, each). To vary or add flavor, try adding a clove or two of garlic, a touch of chili powder, a tablespoon of tahini, or a generous sprinkle of nutritional yeast. Add a little at a time to get it just right. When freezing leftover sauce, portion it out in advance. For example, if you think you'll make a dip or gyro spread, set aside a cup. If you're making stuffed peppers, you will need two cups. Portioning out the pasta sauce in advance makes it easier to use without wasting.